Les Hinton, Gilbert Sawyer, Mr Case, unknown, Hop Phelps, Peter Armstead, unknown, Henry Clarke. [Box had its own fire brigade for many years; in fact it was one of the earliest to do so. The Metropolitan Fire Service was founded in 1866 and the Box service started in 1879. By the 1930s there were over 1,500 local brigades in force, often functioning with part-time volunteers, sometimes with expertise from insurance companies. It may come as a surprise that there was a time when Box could boast of its own independent Fire Brigade. Before you conjure up the vision of a sleek red machine capable of delivering hundreds of gallons a minute onto a fire, think more along the lines of a manual pump seated on a cart being pushed or drawn by a number of men to the site of a fire. This latter description might have closely resembled the Manual purchased in 1879 when it is presumed the Box Fire Brigade came into existence. From 1895 onwards, when it seems the Parish Council took on the responsibility for the Brigade, Minutes frequently make reference to it and provide an interesting insight into its activities or should I say, lack of them. The first reference to the Brigade in an item of the 26th September 1895 was that the present Captain, Thomas Merrett, should be re-elected and that he should be given absolute power as to the organising of the Brigade for which purpose an annual sum of £8 would be made available. In passing, it should be said that Captain Merrett was a member of the Council and a local builder. We should all be relieved he wasn’t a Bank Manager!! Each year the Captain had to submit a report to the Council on the state of the Brigade. These reports, with regular monotony, state all was in good working order and that three or four exercises had taken place. It wasn’t until 1909 that the Captain reported a fire. This must have resulted in much interest if not excitement in the Council Chamber, until they discovered that the Fire Brigade had not attended. It seems that a far sighted farmer who discovered the fire realised that there was no water supply close enough to feed the Manual (the type of engine used in Box) and the Fire Brigade would be of little use. Captain Merrett must have been put out by this apparent snub, given that the Brigade had never had the opportunity to demonstrate the skills developed over the years. Some four years later, in 1913, the Parish Council returned to this subject when consideration was given to the purchase of more hose after one length of canvas hose broke in half. It seems this was one of the original five hoses delivered with the Manual. These hoses, it is believed, were 80 feet long. Now it doesn’t take a mathematician to work out that the Manual would only be effective when fighting fires within 400 feet of a plentiful water source. Given that the only source was the By Brook it seems the Council was waking up to the fact that their Manual was perhaps something of a white elephant. As this modern video shows, manual pumping certainly would have been hard work and would have needed many people. The years rolled by without any request for the Brigade's services. Then in July 1918 Captain Merrett resigned and his place was taken by Arthur Chaffey. In his first report in 1919 Captain Chaffey made reference to a fire the Brigade attended. However, it was a hay rick at the top of Box Hill so all they could do was stay in attendance and ensure sparks didn’t set fire to anything else. The Captain also mentioned the new domestic water supply being considered for the village and recommended the installation of hydrants. Captain Chaffey was clearly more farsighted than his predecessor; perhaps luckily he was in charge during the golden years of the early twenties when the Brigade dealt with several fires including one in a garage in 1922. Whilst the garage burnt down, they did save a car housed in the garage and prevented the fire spreading to an adjoining stable. In 1927 it was proposed that the Brigade be disbanded and a permanent fireman be appointed. You might well ask why, given that in the life of the Brigade no more than a handful of fires had been reported and in most incidents the Fire Brigade had been little more than bystanders. The answer perhaps was in the shape of Captain Buckle of the Chippenham Brigade who it appears had some area authority. At the same meeting it was proposed that he be consulted regarding the provision of hydrants. Eventually on the 12th June 1928 it was announced that the Brigade was to be disbanded and a new Brigade formed consisting of 6 men with Captain Chaffey as their leader. These men were to constitute a first aid party. In 1929 Captain Chaffey reported that they had attended no fires that year although Chippenham Brigade had attended two rick fires. Again in 1931 the Captain reported they had attended no fires. Chippenham Brigade had attended a fire at Middlehill but no approach had been made to the Box Brigade. It seems calls were going direct to Chippenham. The Chippenham Brigade had a motorised engine purchased in 1922 that could travel long distances and no doubt could provide water, thus the need for the Box Brigade was fading. By July 1931 Captain Chaffey resigned to be replaced by Captain Mullins. A vote of thanks was given to Captain Chaffey who had served for over 40 years which made him nearly as old as the faithful Manual, which for some reason hadn’t been mentioned for years but was still in service. Two standpipes were purchased in the same year: one for the Fire Engine House and one to be labelled Box and held by Chippenham Brigade. Now forgive me for asking, why not leave it in Box where its use was intended, but what do I know? In 1934, after hearing the Captain's report, which primarily said there was nothing to report and the equipment was in good order, the Chairman of the Fire Brigade Committee in winding up the meeting was reported as saying he didn’t think there was a Parish in the country better provided for in the case of fire. A Manual, a few lengths of hose, some extinguishers and a fall back to a brigade 7 miles distant clearly impressed the worthy gentleman. Between the years 1934 and 1937 no further meetings of the Fire Brigade Committee took place. However, a meeting did take place on the 25th March 1937 to discuss proposals regarding Air Raid Precautions. Some time between 1934 and 1937 Captain Mullins left the post and so at a meeting in Chippenham of local Captains, Box was represented by Captain Browning. This was the first time his name appeared. 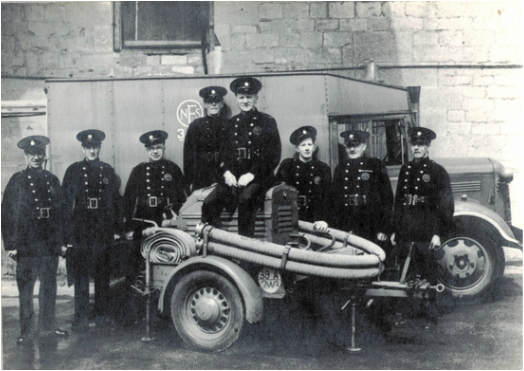 At a meeting of the Fire Brigade Committee on the 25th October 1938, Captain Browning said that our position as a fire brigade is hopeless and suggested that, with the importance being given to ARP, there was a need for a portable fire engine, hose and hose carrier. In discussion the Fire Brigades Act 1938 was consulted and it was noted that the responsibility for fire protection rested with the Rural District Council and that furthermore, Parish Council Fire Brigades ceased to exist following the formal application of the Act in the area. Box Fire Brigade Ceased to Exist - or did it? True to form, the Box Fire Brigade Committee decided to ignore this and busied themselves by suggesting improving the access to the extinguishers sited in the villages and to obtain others. Mention was made of the old Manual which was now considered useless and therefore a new trailer pump and equipment should be obtained and the number of firemen increased to twelve. Despite all the discussion and grand ideas, common sense prevailed and a majority vote agreed that the Box Fire Brigade be disbanded. But this was not the end; a new Brigade of 10 men led by Mr Abrahams rose from the ashes. It seems that in 1940 the Rural District Council still thought Box Fire Brigade a viable parish unit and purchased its facilities, engine shed and equipment less the now ancient Manual which was sold as scrap for £2 and 5 old shillings. The now re-vitalised Brigade with a Beresford Trailer Pump and a mass of small gear was ready for action under the authority of the Rural District Council. In conclusion, let us not look unkindly at the men and Captains of the Box Fire Brigade but rather salute them for their commitment and effort in attempting to use the inadequate resources available to them at that time. I seem to remember my dad saying the fire brigade was based in the building opposite the school, which belonged to the Sawyer’s, but has now been converted into a bungalow.